Calvin Harris has revealed he'd love to work with The Killers star Brandon Flowers. 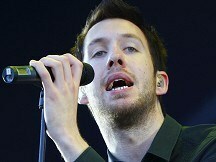 Calvin performed at Scotland's biggest music festival T In The Park, which came to a climatic close on Sunday night following three days of performances. I'm Not Alone hitmaker Calvin said of fellow T act Brandon: "He's got a great, very recognisable voice, which is what I like - distinctive voices." The star also joked he would like to follow the lead of fellow T In The Park performer Deadmau5, who traditionally wears a giant mouse head outfit onstage. Calvin said: "It would be quite nice to wear an actual mouse. Or a tiger." Synthpop duo Hurts, who also played the King Tut's tent, were delighted with the packed audience. Keyboard player Adam Anderson said: "It was full. I was amazed by it. We were so tired but when we saw the crowd I got a massive lift. I gave my whole band a pep talk - 'see how many people are there? Let's give them something to remember'. And I think we did." The event - which is staged at Balado Airfield, near Kinross - featured a cross-section of music genres from rock to dancehall. Indie band The Vaccines praised the festival and said it was "everything and more". And they revealed they were grateful for being rescued from a sticky patch on site. "Thank you to the man in the tractor for pulling us out the mud," the band said on their MySpace page later.